How about that Giro hey? Apart form some ridiculously boring early stages, it was a ripper of a race. However, it seems a hell of a lot of my fellow aussie cycling fans missed out. How many you ask? Well, due to the fact that I don’t have the rights to publish all the numbers, I cant show a breakdown of the actual numbers for each stage (the figures I have come from multiple sources), but I reckon this graph might give you some idea. For all the gory details of what happened with the rights, see the always excellent Inrng.com post here. Now, going back to the figures, there was a shade over 1.5 million views of the SBS coverage for the 2016 race for all the stages. The payTV audience didn’t even make it to 10% of that figure in either 2016 or 2017. 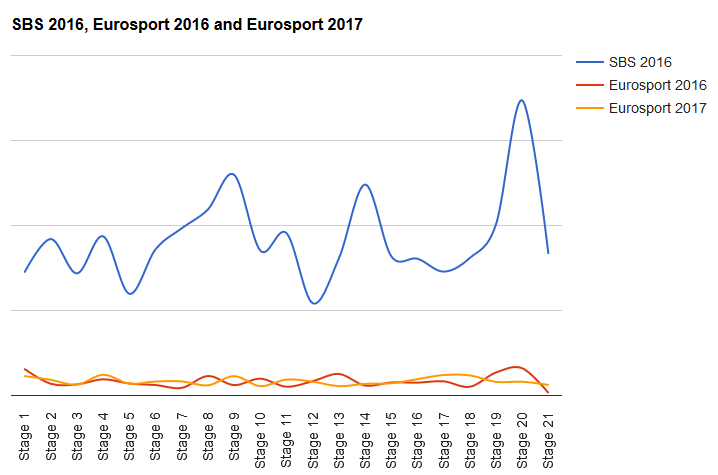 The Eurosport audience grew 1.4% from 2016 to 2017, so exclusivity did bugger all to their audience. In theory, a potential 1.5 million plus eyeballs missed out on seeing the Giro this year, in Australia alone! I don’t have global figures, but I can’t imagine they would be a lot better. Now, imagine if you are a team sponsor. You think they would be happy about this? They are missing out on a huge amount of exposure. I have no idea what we, as Australian cycling fans can do. I was thinking about the anti siphoning laws out here, but from what I can see on the Wiki site about it, cycling isn’t even listed on the list of sports covered. Maybe this is one avenue? The relevant Minister has the power to add, amend or remove events from the list. I don’t know the answer, but it seems RCS have shot themselves in the foot with this decision. Let’s hope it is looked at before next years Giro. This entry was posted in Pro Cycling and tagged Eurosport, giro d'italia, RCS, SBS. Bookmark the permalink. 2 Responses to Is RCS Killing the Giro TV Audience? Pity it wasn’t seen on SBS…long time supporters of the event & indeed all things cycling. IMG did the deal with Eurosport to show the Giro exclusively through to 2020. Be interested to see the numbers for Eurosport worldwide…in particular Europe where most of the bike major sponsors markets lie…& obviously the markets they’re targetting. SBS are certainly keen to provide coverage and it is also a race which is compelling, from the importance of the race, the timing, location and tradition. Eurosport broadcast internationally and in Europe they are free-tv (for many countries at least) and will commentate in many languages. If they have the broadcast rights (and for the Australian market can provide through PayTV), the organisers have an immediate financial benefit from this large broadcaster – and it is better value to provide Eurosport with rights for Australia. In the long-term, it will affect the broader popularity of the Giro d’Italia among Australian cycling fans but still may not have a significant impact for the organisers. • Write to the SBS – when management see the significant audience interest, they can invest more budget / energy to making a deal. Regarding the suggestion of team sponsor coverage and exposure – Australian coverage is a long-shot. The teams pitch to sponsors with promise of coverage and the exposure is over TV as well as digital and print media and the sponsors association (e.g. company marketing). In the grand scheme of a protour team. the Australian consumer audience is tiny and most international brands would be looking at Europe and North America and primary markets. Major teams ride in the Tour Down Under and get local coverage (but let’s not talk about broadcast rights for that) and through the Tour de France, broadcast of the classics and through media reporting get good coverage. From an Australian cycling fan perspective – the limited access is not awesome (but wont impede the real enthusiasts) while from an organiser and international perspective, it has very low importance.